Big Apple tires take the bite out of potholes and much more, adding a generous dose of comfort to the Kettwiesel’s solid roadholding and fun-filled cornering! 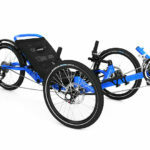 BRC: Unquestionably the best quality delta style trike on the market! Hase: Luckily, the practice is sometimes so colorful, exciting, and uplifting that it reminds us again and again what life’s about. 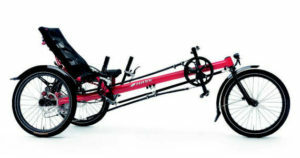 One wheel in front, two behind, and you in the middle: thanks to its design, the ­KETTWIESEL is the most maneuverable trike on the market. And it makes the city asphalt jungle just as fun to navigate as remote nature paths or untamed obstacle courses. Some love the sport-and-fun factor of the lightweight cornering machine. 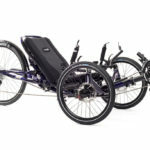 Others rave about the special mobility: exceptional ­stability from the low center of gravity and three wheels, comfort – how many cyclists can put their feet up at the stoplight? – and of course the cozy and adjustable mesh seat. 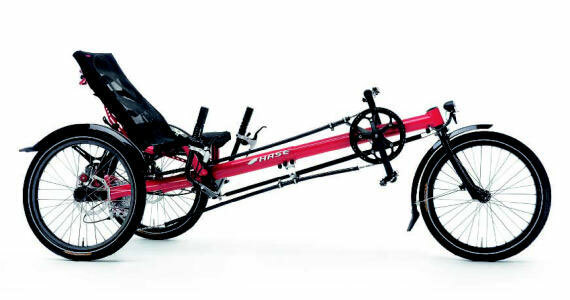 But it’s the details that make this trike such a ­versatile “whiz kid”: with the quick-adjust frame, you can change the seat-to-pedal spacing without shortening the chain. For people from 4’3” to 6’7” (1.30-2.00 m) in height, the KETTWIESEL fits like a glove. The two disc-stoppers on the rear wheels bite down hard and guarantee safety when you need it most. When parked on end, the trike even has a small footprint for storage. And for transport, it can be transformed into a compact package – in a flash, thanks to the HASE BIKESQuickstick hubs, which let you pop off the wheels with a few easy twists and turns.